I'm not quite sure when they moved in. First we were seeing one or two small black ants at a time. They were in the basement near the woodpile, so I thought they were coming from the wood. Then we started seeing an ant or two or three on the main floor, closer to the kitchen. I knew those weren't from the woodpile, and it was past time to do something about the ant problem. Borax/sugar water solution placed on a sour cream lid. Like most of what I do around the home and yard, I wanted an ant control option that was as non-toxic as possible (except to the ants). I hit the laundry room and the pantry and made up the ant bait. I set one spoonful out in both locations, and the next time I checked, both of them were swarming with ants. Yuck! Thankfully, after a few days of frantic bait munching, the numbers have trickled to almost nothing, and our indoor ant problem should shortly be at an end. 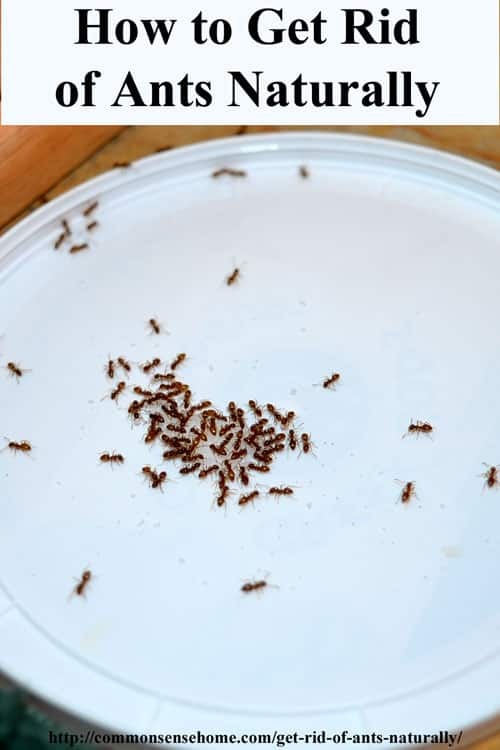 For sugar ants, you can mix up a bait solution of sugar water and borax, similar to the commercial ant bait Terro® (or if you don't want to mix up your own, just buy some Terro®. In small quantities (such as the spoonful that is typically put out as bait), it's pretty safe for kids and pets. Many years ago, when my eldest was a toddler, he put everything in his mouth. Somehow he found the piece of cardboard with Terro® on it that I had hidden in the back of a closet. I called poison control, and they assured me that he should be fine, which he was. That said, do try to keep your bait out of reach of children and pets, just to make sure they don't manage to hunt down enough that it could make them sick. I don't want some tiny pup turning up sick or dead due to ant bait overload. For instance, I could make up a small batch with 1 teaspoon Borax, 3 teaspoons sugar, and enough water to make it like syrup. Or I could make up a large batch with 1/3 cup borax and 1 cup corn syrup and keep it in a sealed jar to use as needed. Place the ant bait on a flat or shallow surface, such as a piece of cardboard, a used canning lid or a lid from sour cream container. You want to make it easy for the ants to get access. If children or pets are a concern, you can use a plastic container and punch small holes in the side close to the ground so the ants can get easy access but kids and pets can't. Liquid bait works best, probably because the Borax spreads throughout it more evenly. In inexpensive corn syrup will work just fine for this, but I don't usually have that in the pantry, so I just make up sugar water instead. You could also use molasses or jelly, but why waste the good stuff on critters you're trying to get rid of? More Borax will not kill the ants faster! Don't be tempted to add more Borax in hopes of knocking out the ants faster. The goal here is to get them to take the sugar/Borax mix back to the nest and feed it to the queen, so the whole colony is wiped out. If they tip over as soon as they take a bite, it defeats the purpose. This bait will work best if refreshed every couple of days or so, because a crust will form on the top, making it tougher for the ants to eat. I have a very unpleasant memory from my childhood involving wood ants. We never had them eat the house, but sometimes they came in with the fire wood. I had been seeing a large wood ant here and there in the house for about a week, and didn't think much of it. I squished them and went on my way. One spring Saturday morning, I stumbled into the kitchen, poured myself a bowl of cereal and plopped down in front of the TV to watch cartoons. I noticed an ant crawling on the edge of my cereal bowl, so I dispatched it. The next thing I know, I realize that the bite of cereal in my mouth is kicking. Ewwwwww! Sure enough, I look down into my bowl, and there are about half a dozen large ants trying to use the puffed corn cereal as life boats. I ran outside and spit out the mouthful of ant and cereal, and gave the rest of my breakfast to the dog. I know I can eat bugs (there's even a post on the site from my bug eating friend, Paul), but that was gross, and a strong endorsement for never engaging in distracted eating. Blech. If you do spot carpenter ants in your home, you'll want to inspect for signs of damage such as “frass” – fine wood trailings that look like sawdust, which you may be able to track back to the colony. Wood ants prefer damp wood, such as moist areas under a shower, decks, foundations, wood piles (check!) and nearby trees. If the colony has gotten large enough, structural repairs may be necessary in addition to getting rid of the ants themselves. Like many household pests, such as mice and ants, leave chemical trails that they follow around your home, so cleaning the area with strong smelling cleaners such as vinegar can be disruptive to their feeding patterns. DIY Natural suggests the use of Food Grade Diatomaceous Earth (DE) for carpenter ant control, spraying or injecting the powder straight into the nest area. You can purchase bulb dusters online via Amazon.com and at some garden or hardware stores. Be careful not to inhale the powder, as it has microscopic sharp edges that are not good for your lungs. If a colony senses something is up when its members start dying and begins to feel stressed, the Queen Ant will likely give orders for the colony to split up into a few smaller colonies, trying to preserve as many members as she can. This is why it may take several days of laying out fresh bait regularly–you’re trying to get enough poison into all the colonies to wipe out the whole lot. If you truly need to get ants to move out, activities that regularly disturb the nest may do the trick. 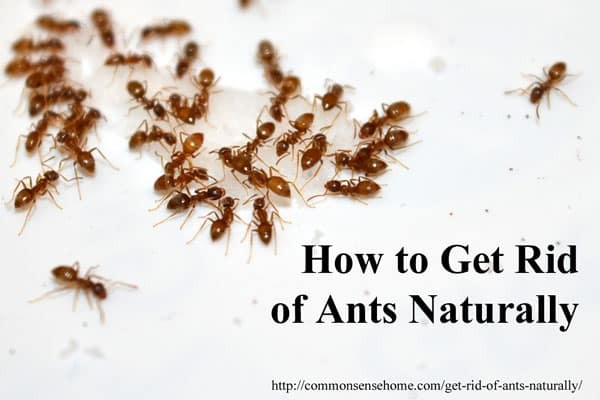 Applying water, diatomaceous earth, vinegar (this may also kill plants, so be careful) or strong scented herbs like mint or sage to the ant hill will encourage ants to move to a new location without killing all of them. Readers also suggest putting corn meal out by the ant hills. The theory is that the ants eat the cornmeal and it swells up inside their stomachs. I haven't tried this method. As I mentioned above, I try to let outside ants do their thing, and suggest you do, too. I hope you found this post useful. If so, please share or Pin. If you have a tip for getting rid of ants (especially fire ants), please leave a comment below. Wondering why your home has bug troubles? Check out this infographic from Terro®. Fire ants! Best way to get rid of them is to move and not take them with you. But if you can’t move, there are two ways I’ve found to deal with them. First way is to liberally sprinkle the mound with grits (from the cereal aisle in the grocery store). Theory is that the ants eat the dried grits, consume water, grits swell and kill the ants. Second way is much more fun. If you have two mounds in close proximity, take a shovel (wrap the handle above the blade with a rag that has gasoline/kerosene/diesel on it to keep the ants from climbing the handle to your hands) of mound #1 and dump it on mound #2. Then quickly take a shovel full of mound #2 and dump it on mound #1. This begins an ant war, which the ants will fight to the death, thereby killing both mounds. I was reading as I was researching that the grits thing was tested by a Texas University and found not to be very effective, because the ants feed the larva the bigger food and then the fully grown ants eat “nectar” produced by the larva. The shovel option sounds more promising. Treatments may be more effective on sunny, cool mornings when the majority of ants and brood are closer to the surface of the mound. Scalding water (190ºF-212ºF) has been used on mounds with an elimination success rate of 20%-60%. Slowly pour at least 3 gallons onto the mound, being careful to avoid getting burned. A mound may need several treatments to reach and kill the queen and brood. Hot water may injure plants near the mound. Fire ant mounds can be dug up and removed. Apply baby powder or talcum to shovel handles and the inside of the bucket to keep ants from crawling up and escaping or stinging you. A Texas A&M Extension study showed potential success with a mound drench treatment of 1.5 fluid ounce of orange oil and 3 fluid ounces of liquid dish soap per gallon of water. After one week, there was a significant reduction in the number of active mounds in the treatment plots compared to other treatments. Researchers did cite the need for future studies to confirm the effectiveness of this treatment. (Optional) Broadcast a bait-formulated insecticide. At least 3 days after baiting (if applied), drench individual mounds with hot water. Excavate and/or reapply hot water to mounds that are still active. Repeat as necessary. (Optional) Semi- or annually broadcast a bait-formulated insecticide to suppress reinfestations. Many home remedies and control devices have not been scientifically proven to reduce fire ant populations. Most of the time these treatments just disturb the mound or kill enough ants to cause the colony to relocate. If the queens are not killed, the colony will not be destroyed and will most likely establish itself in another nearby area. Club Soda. One myth is that pouring club soda onto mounds suffocates the colony. This method is ineffective and at most may only drown a few ants. This method has been promoted on the Internet along with an inaccurate statement that the method is recommended by Walter Reeves of the University of Georgia. Grits. Fire ants only ingest liquids, so the idea that they will eat the grits, swell, and then explode is false. Soap or wood ashes. These substances supposedly remove the wax layer that protects the ant’s body, which is not true. Shoveling mounds together. Multi-queen colonies are not territorial and this method is not even effective for single-queen colonies. Florida has multi-queen populations, so by following this ineffective method you risk increasing your fire ant problem. Some “non-pesticide” treatments are harmful to the environment and dangerous to apply. These include gasoline or petroleum products, battery acid, bleach, ammonia, or other cleaning products. hmmmm…looks like the vote down the shovel method, at least for Florida fire ants. We had carpenter ants coming into our house this spring, but not actually living in our home. We didn’t have huge huge numbers, but especially in the kitchen, we had enough to really bother me. To get rid of them, in addition to killing every ant we saw, I decided to do my best to limit anything attracting them, like food particles (tough with three little children dropping things all the time) and to remove the scent trails that they left for the others to follow. So after every single meal, I cleaned obsessively, vacuuming, washing the floor, cleaning not just counters but cabinets and walls and handles, the outsides of jars/bottles, and I washed the surface of every item in our pantry (like honey jars, etc.). I used a spray of 1/2 vinegar, 1/2 water, with drops of ant-repelling essential oils in it. That was enough to disrupt and confuse them and I found it really worked. I used lemon oil and peppermint oil, sort of alternating to see which worked better. I found they both worked fine. I also put cotton balls with either oil on them in the cupboards and corners of the counter or any other areas where I saw them frequently. Living in the woods, I know I’ll probably have to deal with this each year, but at least I found a way to deal with them that was natural and kept my kitchen and floors beautifully clean while it lasted! Good for you on being able to keep ahead of the ants and kids with cleaning. I swear every time I turn around there’s a new crumb trail around here. I’m trying to train them all to clean up after themselves better, but sometimes it’s like herding cats. ANT BARRIERS One thing you can do is get a big container of chili powder at the grocery store. You sprinkle the chili powder around the home outside all the way around, Ants run away. If you have a large place get warm water and a bug spray 2 gallon or one gallon sprayer add chili powder shake or stir it up to make a reddish solution about half the chili powder container and spray around the outside of your home. These two things keep ants out for at least 6 months. The first time I encountered a ‘moving’ mass of red/rusty ants I was nearly sick to my stomach. I learned that it was a mound of red/rusty ants. Periodically we find a gathering at the edge of the concrete deck around the pool. The mound could be as large as 9-12 inches across. If this happens a safe way to get rid of them is ‘put the kettle on’ and then pour boiling water over them. Do remember that the boiling water will kill vegetation as well. Living with my sister in her older house, we have always had to deal with ants in the kitchen – no matter how much we cleaned. About 2months ago, I was going to check my outside storage -opened the door & there was a long line of ants going up 3 tall boxes & lots on the floor – For this I used the Raid that creates a fog & penetrates inside walls & boxes. – Because of all the rain we’ve been having – I had to use another of these a month later -not as many ants but too many this time. — That said, I purchased about 10 pounds of Food Grade Diatomaceous Earth (DE) (wore a surgical-like face mask & gloves) & put in 3 other containers as well as several real small squeeze plastic bottles & 1 larger one. – I used a smaller bottle to put this under the kitchen cabinets & around the backsplash/counter. It took about a week – but we’ve not seen any more ants inside. For the outside storage I dusted this DE all over the boxes & floor. –Those who know nothing about DE – many people take this mixed with liquid (Food Grade only) and everyone should research online to find out more info. I’ve relocated them in the garden when they turned some plants into aphid farms. There are plenty of weeds around that they can use for that instead. well, it’s not natural, but Amdro ant block works very effectively. If you pour some of the crystals on the ant hill, then cover it with a bucket or something to keep the kids and pets from getting into it, the ants move their hill about 30′-50′ away. the Amdro will kill many of them but won’t kill the whole nest unless the queen dies. At least this is something that won’t become airborn or travel to pollute plants or water. I recently had a problem with red ants and separately, carpenter ants. Down here in the RGV, carpenter ants eat only live vegetation. I have seen a colony of carpenter ants decimate an entire 4 foot rose bush in one afternoon. I bought the Amdro granules from Lowes specifically designed for carpenter ants. The red ant beds had multiplied to six or seven beds in my front yard, and the beds were moving closer to the house. I tried the granules on them, but then a new mound would show up. I bought a bag of fertilizer like stuff that was in fact insect poison. I used a fertilizer spreader to spread it. It requires watering after and had been getting a bunch of rain. It did ran a couple days later, and I still found activity on the beds, so I went to the boiling water trick and I have not seen any since. Yes, it did kill the grass. I did use a long nose funnel, and shoved it into the hole then adding the hot water. then the hot water method works. I used a long nosed funnel, shoved it into the hole, and poured the water in. I had seven ant hills and did each one separately. The granules do work but you have to replenish them daily. A mixture of equal parts of borax and sugar put directly around the mound will kill certain kinds of ants. Borax is available at your grocer in the laundry section. I’ve also found a borax solution to be pretty effective at eliminating ants, but as Laurie points out, it’s tempting to try to go overboard and use too much. I have use the method also that you find two mounds and take a shovelful of dirt containing ants from each mound an transfer them to the other mound. Ants are very territorial and will fight to the bitter end to kill the outsiders. Did this once in Ohio and didn’t have ants for a couple of years. Small black ants in the kitchen floor are particularly persistent. They will completely cover any pet food left out overnight. They also,will cover pet food left on my side porch. I tried using a white vinegar spray on them,but they seem undeterred. My Chlorox kitchen spray will kill them dead,but that stuff is toxic. I’m going to try sprinkling chili powder around the periphery of the outside of my house as a deterrent to see if that helps. I’m wondering if anyone out there can help me out: summer before last my 2yr old plum trees were beautifully leafed out with promising blossoms. Then one morning I found them covered in black ants with blossoms consumed and leaved curled. I hosed them off and applied a natural repellant at the base (don’t recall what now). I hoped that the next year the leaved would develop normally. Last summer there were some normal leaved and many curled ones. Few if any blossoms. Extension Office wasn’t much help. I’ve noticed that our 100 yr old crabapple trees across the yard seem to have this curled leaf effect in some places too. We live at 6,018 ft. elevation and fruit trees are particularly precious. This Spring, I’d love to have a clue! Thanks! I wonder if it might be leaf curl plum aphid? (From UC IPM “Leaf Curl Plum Aphid“) These aphids curl the leaves, and produce large amount of honeydew. Ants will often “farm” aphids for honeydew – and chow down on more of the plant. That makes sense. Thanks for the link. Also, I enjoy your site – glad to have found it ! You’re welcome, and I’m glad you found it, too. To use: Place a few drops on a cotton ball and wipe on baseboards and other entry points. You can also leave a citrus-infused cotton ball in cabinets and other areas as needed. Repeat every few days until ants are completely gone, or see below for how to use it as a spray. For fire ant – orange oil in hot water poured on mound. Black ants in house – the Borax solution. Clean area with vinegar solution and then spread thin barrier of ground cinnamon on hard surfaces, or cinnamon sticks, and sprinkle cloves on carpet areas. Dried molasses spread over yard, from the house out, changes ph so ants will not nest. I moved into my mother’s old house in Alabama and have been torturd by surgar ants. I can’t even cook without ants coming out of the wall outlet. Too, there is s spiddder infestation. I’ve learned alit from reading all the post and going to try these suggestion, especially the non- toxic ones. Thanks everyone. Good luck on dealing with your unwanted house guests. Glad I could help. We have an more than ample supply of outside ants, too, but for the most part they conduct their business and I conduct mine and all is well.